Discover this delectable Ice Cream Cake recipe! Combine cookies,fudge sauce and two ice cream flavors in this no-bake dessert recipe. Set aside 12 cookies. Crush remaining cookies; mix with butter. Press 2/3 onto bottom of 9-inch springform pan. Stand reserved cookies around edge. Microwave 1/2 cup fudge topping as directed on package; drizzle over crust. Freeze 15 min. 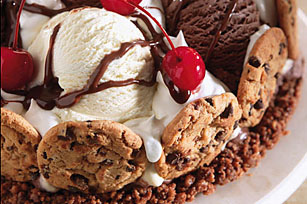 Soften 1-1/2 cups of each flavor ice cream; spread, 1 flavor at a time, over fudge layer in crust. Sprinkle with remaining crumb mixture. Scoop remaining ice cream into balls; place over crumb layer. Freeze 4 hours or until firm. When ready to serve, top dessert with COOL WHIP. Microwave remaining fudge topping as directed on package; drizzle over dessert. Garnish with cherries. You'll know it's a special occasion when you get to enjoy a serving of this rich dessert. To easily crush the cookies into crumbs, process them in a food processor or blender. If you don't have a springform pan, you can prepare dessert in 9-inch pie plate instead.